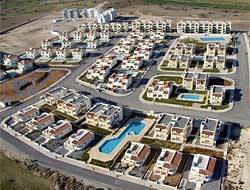 Hilltop Village is one of the best properties listed in Cyprus44 property reviews. PI Property International plc was set up in 1986 by Ali Ozmen Safa, who first started refurbishing properties in London, UK. He moved on to offer property investment services, and moved into the off-plan market. 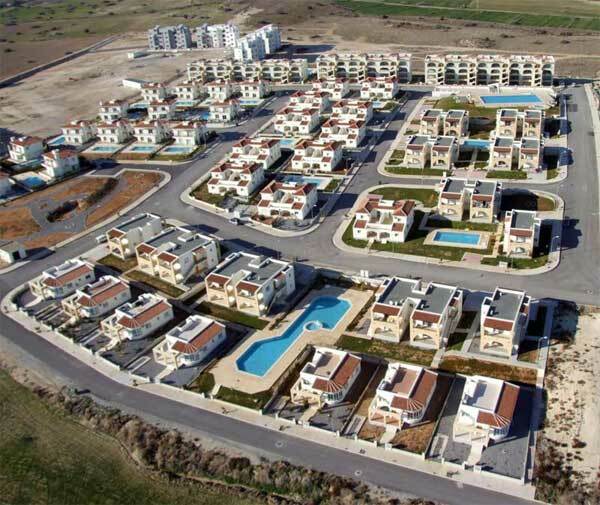 Since, the year 2000, Safa has expanded his business by buying entire developments offplan to resell to those wishing to invest in North Cyprus property. His local company Medview Homes now manage a range of properties for investors and holiday home owners alike. Medview Homes have also invested in infrastructure by constructing a desalination and water treatment plant in Bogaz to overcome local water shortages. Safa's future plans include a car hire company and an airline! Hilltop Village lies just outside the fishing village of Bogaz, in one of the hottest areas in North Cyprus for new property developments. The site is 1km from the sea, and offers a variety of apartments and villas on a roughly square site. The recently released Phase III homes are to one side on the main area, giving more privacy. Medview Homes certainly win the prize for probably the most oddly spelled property names, which bring to mind the Angel characters in the tv series “Thunderbirds” rather than the classical music they presumably wish to evoke; Rapsodi, Harmoni, Simfoni, plus the more expected Concerto and Opera. Simfoni apartments offer two bedrooms and two bathrooms, air conditioning, use of the communal swimming pool, and a sea view. The apartments are housed in uninspiringly-designed blocks with arched windows and external stairwells. Inside, the bedrooms are at the rear, with the full width kitchen-lounge overlooking the terrace. The two storey Harmoni villas offer three bedrooms and two bathrooms with a private garden and private swimming pool, but again the villa’s design is unimaginative. However, inside there is plenty of space, with a good sized living area at the heart of the villa, fitted kitchen and dining area, and no less than three outside terraces. Upstairs, the master bedroom has an ensuite and a dressing room, with plenty of storage space for all those essential clothes and shows you just have to take on holiday! All Harmoni villas are ready to move in to - no waiting for construction to finish! The newly-released Concerto villas are much more attractive to look at, with traditional red roof tiles and more exciting design overall. They feature a designer kitchen, lots of storage space, generous terrace spaces, marble floors, and share a communal swimming pool. The three bedroom version offers a large living room space next to the kitchen, with two bedrooms off the generously sized hall. The master bedroom is upstairs, sharing the views with the large upper entrance. Only three of these style properties are available, with the option to expand it to four bedrooms, three bathrooms if desired. The new Opera bungalows are two bedroom, two bathroom ranch-style properties, with a private garden and parking space, and shared use of a communal swimming pool. Air conditioned, they also have a curving panoramic window in the living space to maximise those views over the Mediterranean Sea. The bungalows are deceptively spacious, and you even have a first floor sun terrace tucked up amongst the roof tiles. At the time of writing, all Rapsodi properties are sold out, only two Simfoni apartments remain at £65,000, four Harmoni villas remain at £149,000 (including swimming pool). The four Concerto villas start at £130,000, and there are three Opera bungalows left to choose from at £89,000. The site is a little soulless at present, but will no doubt improve as residents move in to enjoy the boom years for Bogaz property ahead. This web page is served on 20 April 2019 at 00:07:42.